A sweet and lovely�infusion of natural fruits and flowers. Inspired by the fruits and flowers of an English country garden, our herbal infusions use only pure natural ingredients. They are naturally caffeine free and contain no added sugar. For the perfect cup we recommend that you use one tea bag. Add freshly boiled water and infuse for 3-5 minutes. 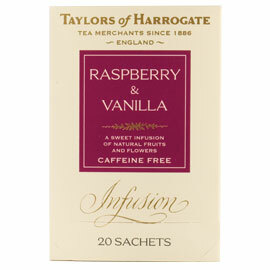 Raspberry & Vanilla infusion should be served without milk, and is also delicious served iced. Packaged 20 bags/sachets per box.